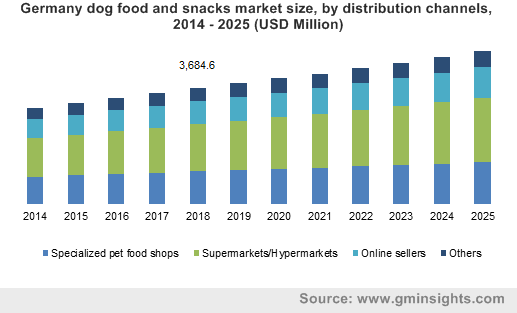 Dog Food And Snacks Market size was over USD 55.5 billion in 2018 and is projected to expand at over 4% CAGR over the forecast timeframe. Robust development of various economic and professional ventures coupled with rapid urbanization in the emerging economies are simultaneously giving rise to the trend for nuclear families. Small families tend in keeping dog as pets in their household, since it provides them with sense of security, social comfort, company and the appealing sense offered by the dogs. Growing demand for healthy, nutritious and organic dog food due to the swelling consciousness regarding pet animal’s health is projected to propel the product market size in the recent years. Moreover, shifting lifestyle and increasing concerns for animal wellbeing, customers are spending excessively on dog food with excellent qualities. Dog owners are quite strict while buying the products, since they want to buy the appropriate food for their dog’s needs and comprises all the required nutrition. Every year, in spring season the dogs tends to lose its fur and grow new hairs and during this time the dogs has to be given special care, as they are prone to skin infection. These dog foods help in battling skin infections and allergies and also improving the overall health and life expectancy of the dogs. Presently, the manufacturers are introducing feeds specific to the age, breed and size of dogs in smaller, single-serve containers and disposable in order to offer suitability to both the dogs and their owners. In 2018, the global pet care business was valued at over USD 115 billion, with customers outlaying most of that amount (USD 85 billion) on pet food. Dog food sums up for over 55% of the entire pet food industry. The administration of several nations has taken ingenuities to offer the use of healthy and safe elements to expand the complete wellness of the dogs. Dog owners are quite concerned about their pet’s health over recent years owing to various problems, especially obesity. Arthritis is significantly mounting among dogs, causing enormous pain and discomfort and over 38% dogs globally are afflicted from this illness. Various respiration problems, allergies, and skin infections from dogs to the owners is the key restraining factor for the market growth. Asthma is also a common disorder among such personnels, resulting from the dog fur. Therefore, it is probable to become a barrier for the dog food market growth over the projected timespan. However, owing to these major ailments owners have been strictly shifting to high-nutrition and low-calorie foodsand treats to uphold their dog’s peak health would create new opportunities for the dog food and snacks market size by 2025. On the basis of product type, the industry is classified into dog food and treat and mixers which is further categorized into dry and wet food. Dog food is expected to generate the maximum revenue in 2018 i.e. over USD 34 billion. Dogs require numerous types of nutrients for staying fit and live a vigorous life such as minerals, proteins, water, carbohydrates, vitamins, and fatty acids. Dog petters focuses on providing nourishment which includes these nutrients for keeping them strong. This provision of nutrition is expected to fuel the demand for dog food and snacks during the forecast period. The treats and mixture segment are anticipated to witness a CAGR over 4% during the forecast timeframe. These are mainly steered for young dogs owing to their high nutritional value and can be eaten any time of the day. These products are available in a wide price range, including economy, standard, premium and super premium. According to its distribution channels the market is labelled into supermarkets/hypermarkets, specialized pet food shops, online sellers and few other channels such as convenience stores, pharmacies etc. Dog food and snacks sold in supermarkets/hypermarkets generated a substantial revenue over USD 23 billion in 2018. The dog food and snacks are sold through big super or hyper markets such as Walmart, E-mart, Kroger etc., where the consumer can choose from a huge variety of brands and products with different nutritional value. It is followed by the specialty pet food shops and online seller, both rising with a substantial rate of CAGR. Specialty pet food shops deals in wide varieties of dog food with several different features. The customer may get everything he wants for his/her dog inside a single roof with additional guidance from the store keeper about what to buy. North America is leading the global dog food and snacks market based on the growing dog population and increasing adoption rate in the region. U.S. is responsible for a major revenue share over 60% in 2018 and is predicted to continue the dominant trend in the coming years. U.S. is ranked first in terms of dog ownership and third in cat ownership at a global level. Around 50% of the pet owners in the country owns a dog. These factors are likely to have a positive impact on market growth over the forecast spell. 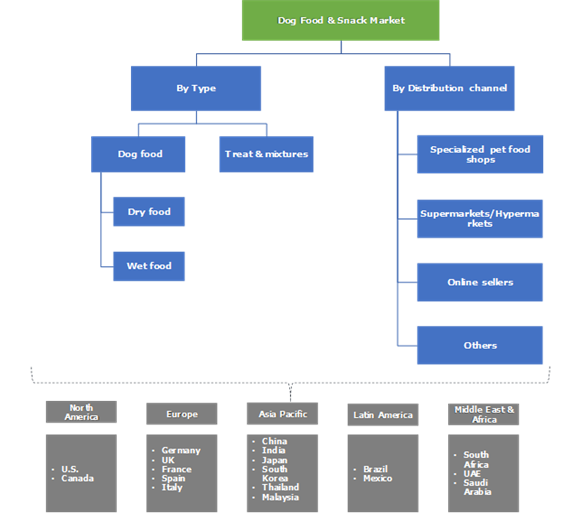 Asia-Pacific is one of the most significant and high latent markets for the dog food industry. In Australia, increase in dog petting has also enhanced the overall market growth, thus resulting in it being the most protruding market in the Asia Pacific. Dog food and snacks industry share is highly competitive owing to the existence of various protruding market share contributors i.e. Mars Petcare, Nestlé SA, Colgate-Palmolive Co, JM Smucker Company, Big Heart Pet Brands, Diamond Pet Foods, Blue Buffalo, Deuerer, Heristo AG, Unicharm Corp., Thai Union Group, Nippon Pet Food, Hill's Pet Nutrition, CJ Cheiljedang Corp and others. Key industry players are focusing on strategic partnerships and new ventures for expanding and improving their geographical reach to gain competitive edge over other manufacturers. For instance in June 2018, Mars Inc. acquired Northern European veterinary operator AniCura Holding AB. With this acquisition Mars made a big lead to the European pet care business. Increasing dog ownership is giving rise to the dog food and snacks market. The elderly populations in developed countries are turning to dogs for companionship. In developing countries with the surge in spending power, the consumer here are petting dogs and also taking proper care of them. Rising drift towards nuclear families and mounting inclination of customers for keeping dogs for company and the sense of security. Based on the type, the global dog food and snacks market is segregated into dog food and treats & mixers, dog food is further divided into dry food and wet food. In accordance to the distribution channel, the market is categorized into specialized pet food shops, hypermarkets, online sellers and others.